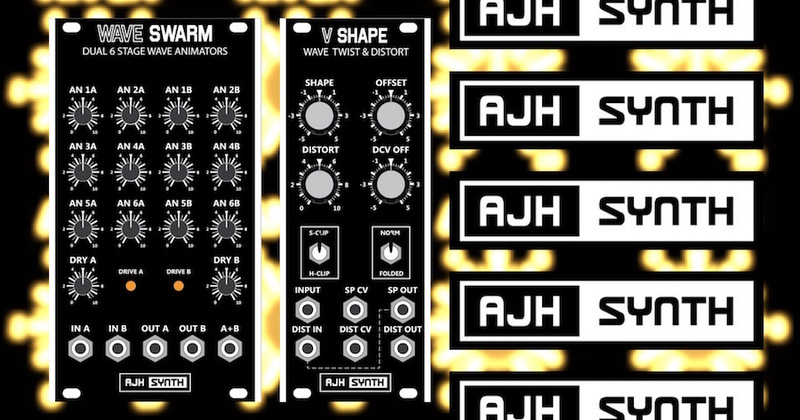 Home / News / AJH Synth WAVE SWARM & V-SHAPE now in stock! ..plus restocks of SONIC XV, GEMINI 2412 & more..
AJH Synth WAVE SWARM & V-SHAPE now in stock! ..plus restocks of SONIC XV, GEMINI 2412 & more.. WAVE SWARM is a waveform animator, and is an all analogue dual channel device. Each channel simulates up to six VCO’s beating in unison with a different beat frequency between each animation. V-SHAPE is two modules in one, a wave twister and a distortion / wavefolding module. Both sections of the module are all analogue in design, and both can be used independently or they can be normalised together in series, so that a waveform can be twisted first and then distorted and wavefolded. We also have stock of the SONIC XV, GEMINI 2412 and selected MINIMOD modules. We can also get most of the AJH Synth range to order – including full systems in DARK or SILVER versions. Previous post: Future Sound Systems GRISTLEIZER module range back in stock! Next post: Strymon MAGNETO 4 head tape delay, looper & spring reverb in stock!